The cats in your neighborhood will certainly appreciate your efforts on their behalf. There are, in fact, millions of cats trying to fend for themselves behind grocery stores, under trailers, and in city alley-ways. But there are also millions of kind people like you doing what they can to help them. Kittens as young as nine weeks can be neutered. Nursing females can be spayed when their kittens are eating solid food. If you trap a pregnant cat it is generally best to spay her anyway. If you trap a nursing female and you are unsure about the kittens, then use your best judgement after talking to your vet. The first step is making arrangements with a local veterinarian. For help in finding a vet or low-cost spay/neuter program contact SPAY/USA at 1-800- 248-SPAY. The next stage is the trapping. Your local humane society or animal control agency may be able to loan you the traps, or you may prefer to buy a humane trap. You can successfully neuter a colony with just one or two traps. The more traps you have the quicker your project can move along. If youre not already feeding the group of feral cats at a regular time, establish a feeding pattern that is convenient to you. It could be before you go to work or early evening. Try and make it the same time every day so that the group becomes accustomed to being fed at that time. If possible, establish the feeding station in an out-of-the-way location where the cats feel safe. Plan a day when you will set the traps, and discuss it with your veterinarian ahead of time. Plan the trapping session at the regular feeding time or you may opt to skip a regular feeding so that they will be extra hungry. Dont withhold food for more than two days or they may go elsewhere looking for food. 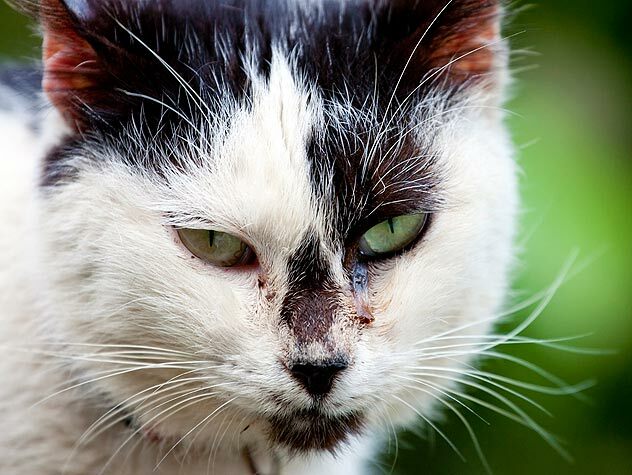 17 million Americans feed stray and feral cats every day. Prepare your traps. It is essential that they be very clean with no left over residue from previous trapping sessions. Clean and scrub with hot soapy water, and finish with a mild bleach mixture spray, rinse and dry thoroughly. You may want to cover the mesh floor of the trap with newspaper or a clean towel, or bed the trap in the dirt, as some cats will not walk on the metal mesh. Take a can of oil-based tuna or sardines and use a generous dollop to bait the trap. This is almost irresistible! Use a small paper plate, plastic dish or peanut butter lid for the bait; avoid using anything that may break or has sharp edges which may injure the cat. Another tip is to smear a paper plate with canned mackerel and place it under the trap, just behind the trip plate. You may also want to place small bits of food leading from the door of the trap to the bait in the back, to help lure the cat into the trap. Place the trap against something like a fence, a shed, a dumpster or better yet, under a bush or a hedge rather than out in an open area. Try to select trap locations that are visually isolated from each other so that a cat in one trap cant see another. Move out of visual range, but dont leave the traps unattended people who might steal the traps, roaming dogs or wild animals can pose hazards to the trapped cats. Cover the trap with a large towel, blanket, sheet or old bedspread, and keep it covered even after you have trapped the cat. It makes them feel more secure and also helps to protect you from claws and teeth. Never attempt to touch a cat who has been trapped while hes still alert. Take the trap straight to the veterinarian where the cat can be prepared for spaying or neutering. You might want to take a photograph of each cat to accompany your written records. This photo and other details can be very useful if any questions arise about an individual cat or the colony. It is also recommended that the tip of the left ear be notched as a permanent record of the spay or neuter. This is very helpful if you are going to be retrapping in the same area. It will enable you to spot an already neutered cat in the trap without having to anesthetize him again. Description: Short hair black and white. Both back feet are white. Comments: He is in good health, approximately 2 years old at trap date. His teeth are good, and there is no sign of any disease process. If your veterinarian has any questions about handling the feral cats they can contact Best Friends veterinarian Dr. Richard Allen or Alley Cat Allies for further details. As well as neutering, you will want to take the opportunity to have your veterinarian do a thorough examination of the cats, and vaccinate for whatever your vet recommends especially rabies. Treatment for ear mites or tapeworm can be given at the same time. Once the cats have been spayed or neutered and while they are still unconscious, place them in a regular cat carrier or back in the trap for the recovery period. This is usually 24 hours from the time of surgery. Make sure the carrier is lined with something soft and absorbent, like a thick towel. There is no need to set up litter boxes, but being able to offer water and food after they are out of the anesthesia is a good idea, as long as you can do this safely without letting the cat out, or having yourself scratched or bitten. As you put the unconscious cat into the carrier, you may want to attach food and water dishes to the carrier door. Put dry food in one dish and after the cat is alert, fill the water dish from outside the carrier using a watering can or squirt bottle. After 24 hours and the cat is fully alert, return the cats to their familiar location, open the carrier door and stand back. Continue your normal feeding pattern. They may be a bit shy after their experience and be less visible, but this will not last long. You may want to provide some kind of shelter if there is none. An old dog house with straw, a corner of a shed or even an unused section of the woodpile. A final note: taking on the care and feeding of a feral colony is no less a commitment than that of taking care of the family pet. They will become as dependent on you for food and contact as does your cat at home. So do not undertake this lightly. If you have to go away on a trip, arrange a substitute feeder. If you have to move from the area, make sure the colony is taken care of by another feeder. It would be inhumane to abandon a colony that has become dependent on you. If you need to move a colony, it is essential that you follow very specific procedures. Cats are very territorial and place-oriented and moving can be quite traumatic for them. Information on obtaining low-cost spay/neuter services, nationwide is available from: SPAY/USA Phone: 1-800-248-SPAY and Friends of Animals Phone: 1-800-321-PETS. Best Friends Animal Sanctuary is the nations sanctuary for abused and abandoned pets. Through our outreach program No More Homeless Pets, Best Friends is helping to bring about a time when there are no more homeless animals, and when every dog or cat whos ever born can be guaranteed a good home with a loving family. The sanctuary is supported primarily by donations. Your contributions are tax-deductible. Thank you for caring. Learn about the best practice of trap-neuter-return when caring for feral cats.